Jellyfish, sea lice, sea nettle, coral, sea anemone and other organisms which belong to the phylum cnidaria family are all equipped with stinging cells. 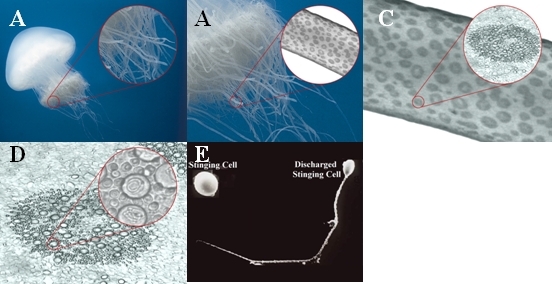 These stinging cells consist of a capsule containing a condensed highly folded eversible needle with potent toxins. The discharge of this needle is driven by the building up of a high internal hydrostatic pressure of 200 atmospheres. This pressure is about 100 times the pressure in a car tire and is similar to the pressure that exists in scuba diving tanks. When jellyfish come into contact with their target, the folded needle is fired from the capsule at accelerations of up to 40,000xg, similar to the acceleration of a shell being fired from a cannon. The jellyfish toxins are delivered into the prey through the needle which resembles a multi-headed poisonous arrow. A. Jellyfish and jellyfish tentacles. B. Tentacles and stinging clusters. C. Clusters with hundreds of stinging mechanisms. D. Cluster with stinging capsules and folded needles. E. Resting and discharge stinging mechanism. A. Stimulants from the skin initiate discharge process. B. High internal pressure of 200 atmospheres is built in the capsule. C. With 40,000xg of acceleration the needle drills a hole into the skin. 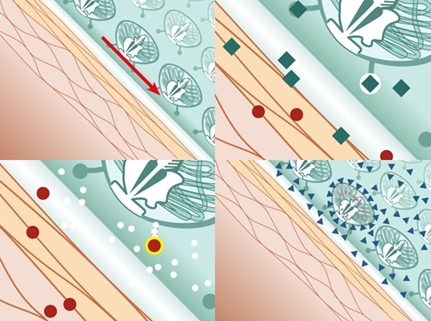 D. A tubule follows the shaft and injects poison into the body. How does Safe Sea lotion works? For quotation and samples press here!